Civil cases make up almost half of the total cases pending in various high courts. The rest is split between criminal cases constituting 13.29 lakh cases and 12.14 lakh writ cases out of the total 49.82 lakh pending cases, data available with the National Judicial Data Grid (NJDG) as on December 27, 2018 showed. More than one-fourth of the burden of pending cases is shared by two neighbouring states Rajasthan and Uttar Pradesh. To be precise, Rajasthan High Court and Allahabad High Court together have 14.66 pending cases of the total 49.82 lakh. This was followed by High Court of Bombay and Madras High Court with a share of 9.3 per cent and 8 per cent in the total pending cases. Sikkim High Court has the least number of pending cases, 255, as on December 27, 2018. Further, as far as Supreme Court is concerned, civil cases constitute 46,860 cases and criminal cases constitute 10,134 cases out of the total 56,994 cases pending in Supreme Court. The pendency of cases in various courts in the country is dependent on several factors including availability of adequate number of judges, supporting court staff and physical infrastructure, complexity of facts involved, nature of evidence, and cooperation of stake holders, revealed the Minister of state for law and justice and corporate affairs in a Lok Sabha reply. The National Mission for Justice Delivery and Legal Reforms established by the government has adopted a coordinated approach for phased liquidation of arrears and pendency in judicial administration through various strategic initiatives, including improving infrastructure for courts, leveraging Information and Communication Technology (ICT) for better justice delivery, and filling up of vacant positions of Judges in high courts and Supreme Court. The number of computerised district and subordinate courts has increased from 13,672 to 16,755 during 2014 to 2018. eCourts services such as details of case registration, cause list, case status, daily orders and final judgments are available to litigants and advocates through eCourts web portal, Judicial Service Centres (JSC) in all computerised courts, eCourts Mobile App, email service, SMS push and pull services. While every effort is made to fill up the existing vacancies expeditiously, vacancies in high courts keep on arising on account of retirement, resignation or elevation of judges (to the Supreme Court) and also due to increase in the strength of judges. Over the last four years, 27 judges were appointed in Supreme Court. 446 new Judges were appointed and 379 additional judges were made permanent in the high courts. 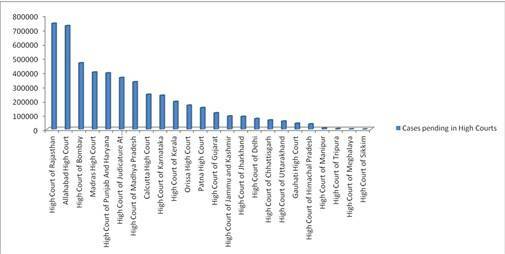 Sanctioned strength of judges of high courts has been increased from 906 in May, 2014 to 1079 currently. Arrears committees have been set up in 24 high courts to clear cases pending for more than five years. Arrears committees have been set up under district judges too. Arrears committee has been constituted in the Supreme Court to formulate steps to reduce pendency of cases in high courts and district courts. Also Read: Will the government push for an appellate tribunal for RBI?